Home|ROW Lessons|English Language Arts (CCSS), K-2, Poetry, Science|Incredible Insects! 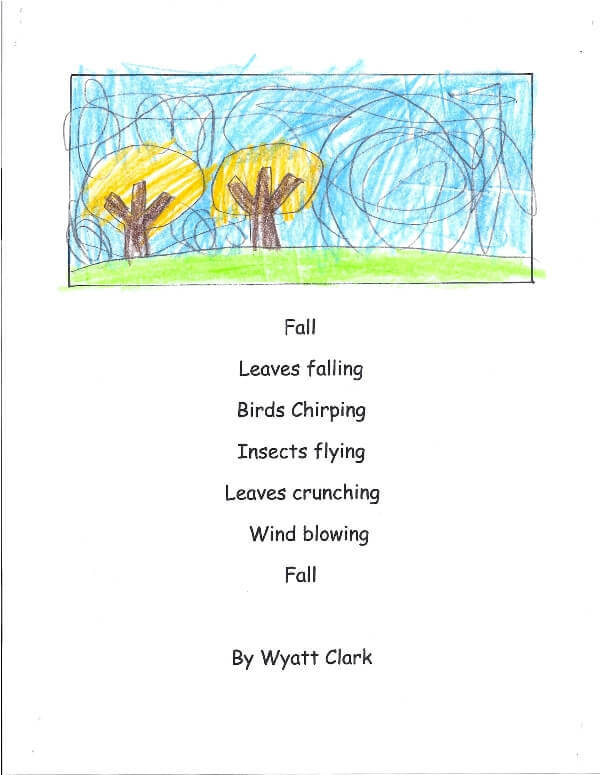 Overview/Rationale for Lesson: Children write and illustrate diamante poems to recall what they observed on a fall field trip to observe insects at Northfield Mountain. 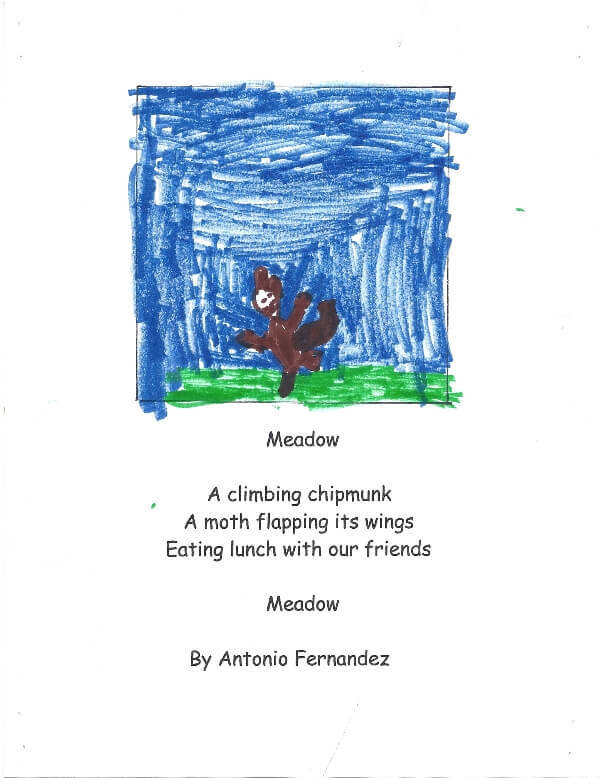 Children will write a diamante poem and draw an illustration, including details of things they saw, heard and touched on their field trip. Children will experience insects first hand and hone their observation skills in an outdoor setting. Step 1. Pre-trip discussion. 10 minutes. Ask children to predict, “What do you think you’ll see at Northfield Mountain?” List responses on chart paper. Step. 2. Class Trip to Northfield Mountain. From 2 hours to 1/2 Day. Children participate in a facilitated session on “Incredible Insects” conducted on the edge of a meadow. 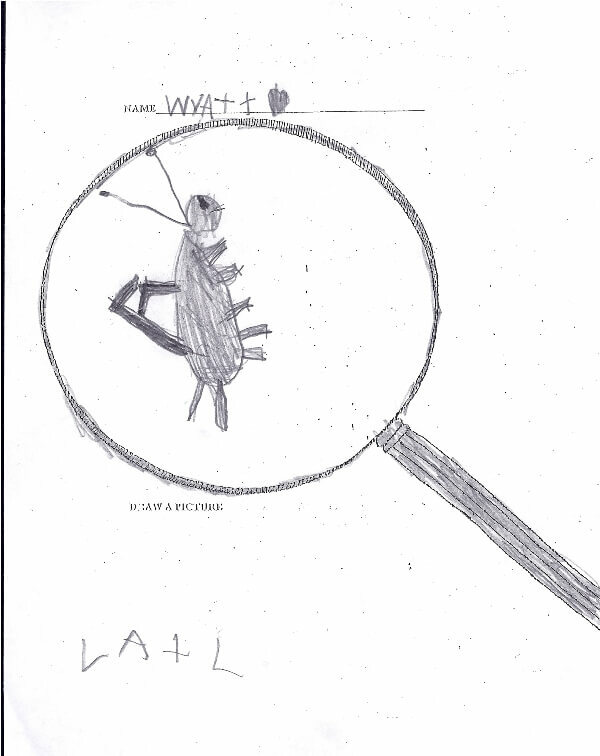 Children look at insects through hand lenses and draw a sketch. Optional extra time for lunch and walk in the forest. Time: 70 minutes (steps may be split into 2-3 writing periods). Step 3. Make a Community List: “What We Saw, Heard, Felt.” 15 minutes. 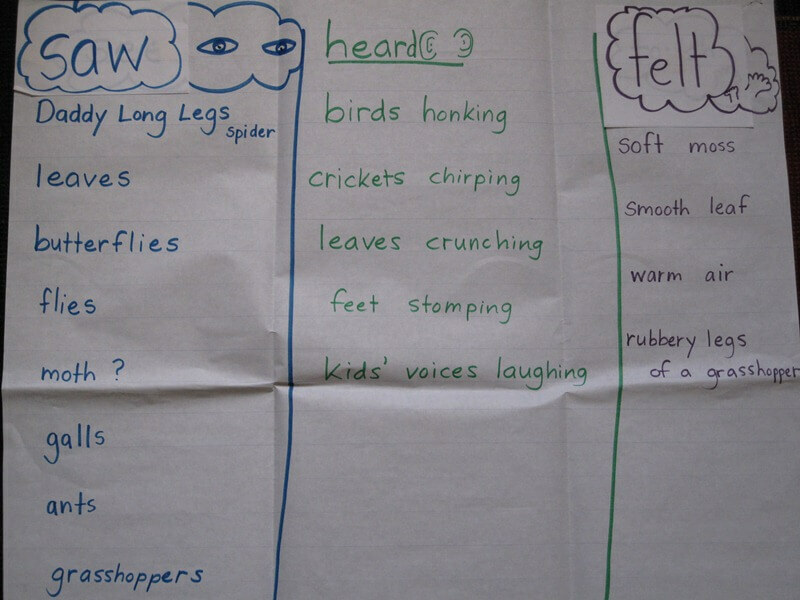 Children generate a list of things they saw, heard and felt during a group discussion. Teacher records comments on chart paper. If available, photos from the trip help to stimulate conversation and spark interest. See a sample Community List. Step 4. Each child completes a pre-writing activity: “I saw, I heard, I felt” (handout downloadable from Materials Checklist). 10 minutes. 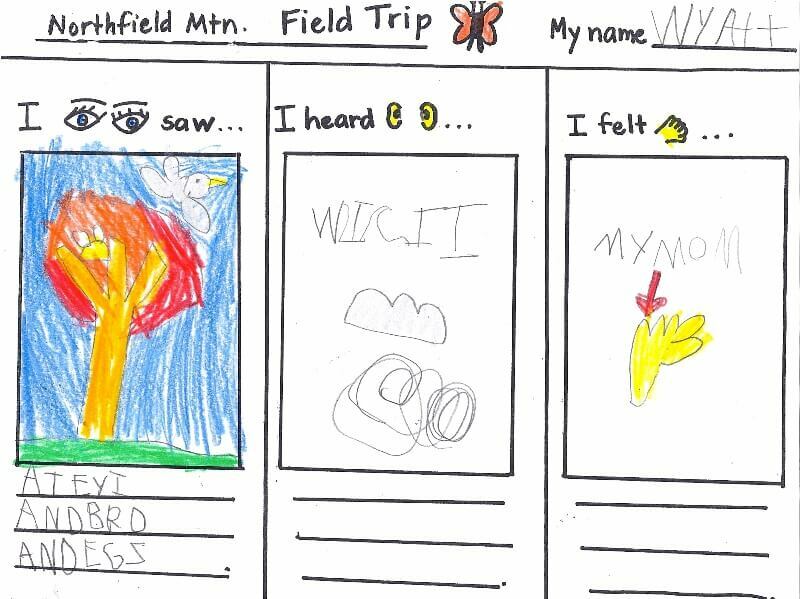 Children use the template to draw pictures and list items they saw, heard, and felt. See Student Sample. Step 5. Model how to write a diamante poem. 10 minutes. 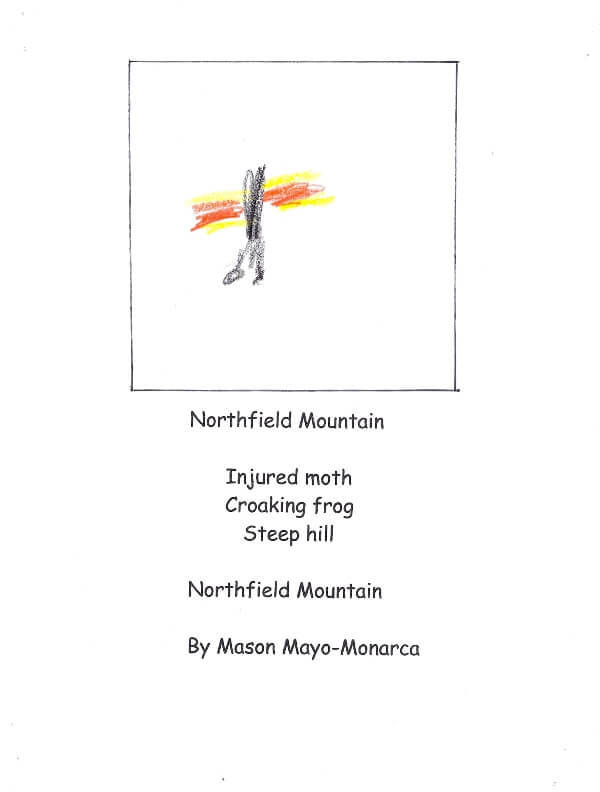 Write a sample diamante poem with the class, showing them how to shape their words from “I Saw I Heard I Felt” into a short diamond-shaped poem. This version of a diamante poem begins and ends with the same word, which is the topic (for example “Fall” or “Meadow”). Middle lines have two words, one of which is a describing word (e.g. “Insects flying”). See Student Sample. Step 6. Children draft a diamante poem. 20 minutes. They make a sketch to go with their writing (before or after writing). See Student Sample. Step 7. Children write and illustrate a final copy. 15-20 minutes. Step 8. Poetry reading. 15-30 minutes. Children read final copy of their poem and show illustration to the class. Step 9. Bulletin Board Gallery Walk. 15-20 minutes. 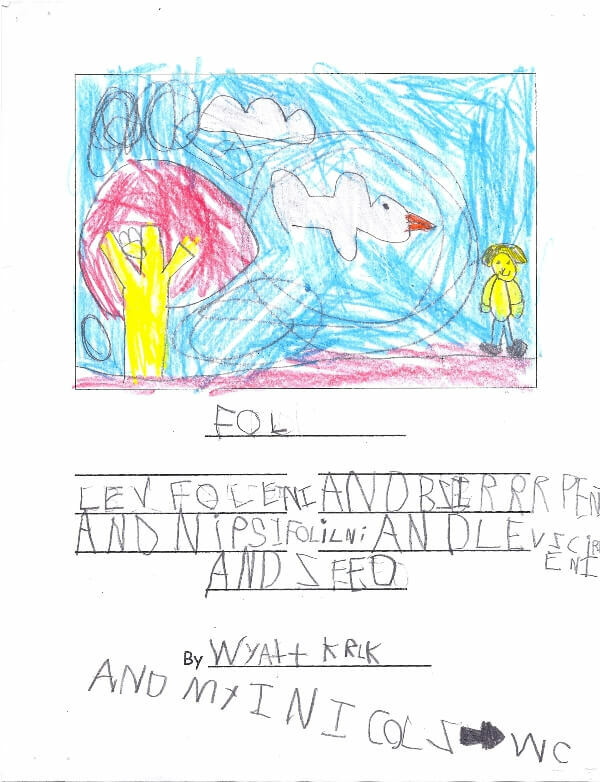 Bring students to see display of poems and illustrations on a bulletin board. If possible, include in the display a write-up of the process, photos from the class trip and link to curriculum frameworks. Art: For some children who have learning issues with communication and print, art is their way into the world. Children with kinesthetic and tactile sensibilities need to get their hands moving with paint. Getting outdoors: Now more than ever because of the digital age it’s important to get kids into the backyard looking at critters. Social learning: Field trips at the beginning of the year help bond a community. Going to a meadow gets kids out and moving, gives them a first hand experience that matches the expansive nature of a 6 year old, and allows them to spend time together. 1: Recognize that animals (including humans) and plants are living things that grow, reproduce, and need food, air, and water. 3: Recognize that plants and animals have life cycles, and that life cycles vary for different living things. 6: Recognize that people and other animals interact with the environment through their senses of sight, hearing, touch, smell, and taste. 8: Identify the ways in which an organism’s habitat provides for its basic needs (plants require air, water, nutrients, and light; animals require food, water, air, and shelter). 1: Recognize that water, rocks, soil, and living organisms are found on the earth’s surface.